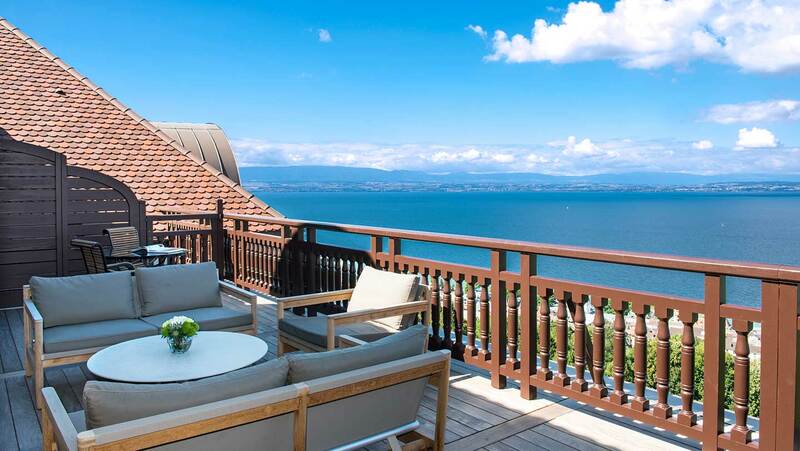 Found among the grand hotels of Lake Geneva, The Hotel Royal and Spa Evian Source sit high above the lake. Opened in 1909, with extensive renovations in 2015, the hotel has played host to golden age Hollywood stars, sultans, queens and even the literary character Victor Frankenstein on his honeymoon. Evian-les-Bains – and its hotels – became fashionable in the Belle Époque with architectural motifs dotted around the spa town. Although the exterior of The Hotel Royal is grand alpine complete with a heavy wooden roof, pale exterior and pretty balconies, inside is a blend of Art Deco and Art Nouveau. Neo-Baroque frescos in soft pinks, greens, yellows and blues line domed ceilings in the public spaces, long light corridors with intricate floors give space to promenade – perhaps more useful during a winter visit when temperatures plummet into the negative. 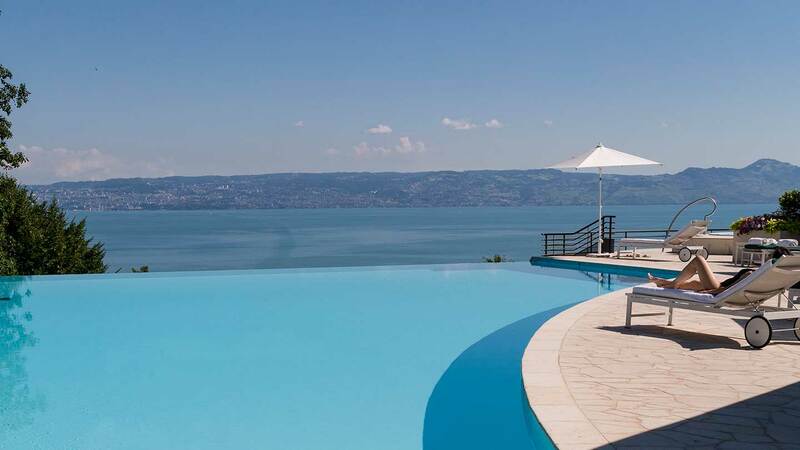 The fan-shaped hotel sits in acres of green grounds; a large kitchen garden boxed in by fruit trees and the outside infinity pool, which looks as though it falls into Lake Geneva, will tempt you outside during the hot summers. Or join the locals and take a boat out on the lake. In the winter, sport becomes about ice and snow. The lake may not freeze over, but the Alps and Jura mountains are nearby. 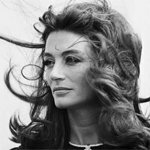 Chamonix, Gstaad and Verbier are about 90 minutes’ drive, or try Les Gets and Morzine which are under an hour from the resort. The hotel can also organise dog sledding and snow shoe walking. The spa has indoor and outdoor facilities so you’re covered whatever the season. Inside, the bright indoor pool with Jacuzzi style seating has large windows either side affording views of the grounds and lake. Loungers line the pool. The thermal facilities are just a few steps away; the traditional wooden sauna and large white steam room are well-maintained and peaceful. Step outside to the warm ‘hydro-circuit’ – a large hydro pool with seven stations where jets will massage your feet, legs, back and shoulders – or just enjoy laying on the bubbly air beds, soaking up the fresh air. 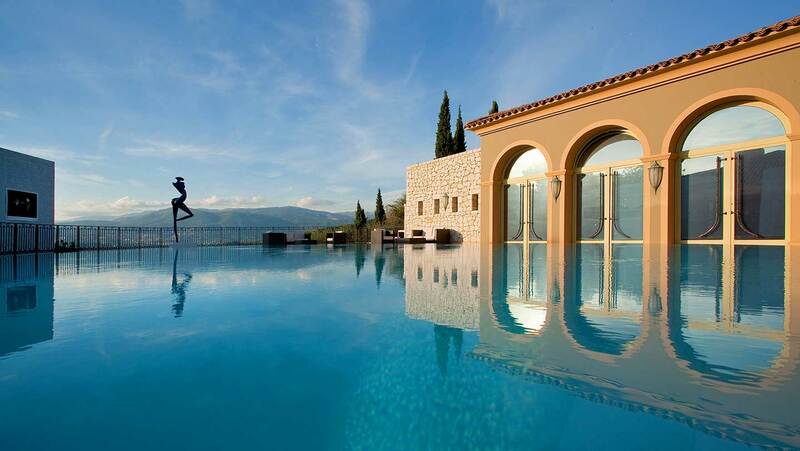 The outdoor infinity pool, which has another Jacuzzi to one side, is open during the summer but closes as the season turns. 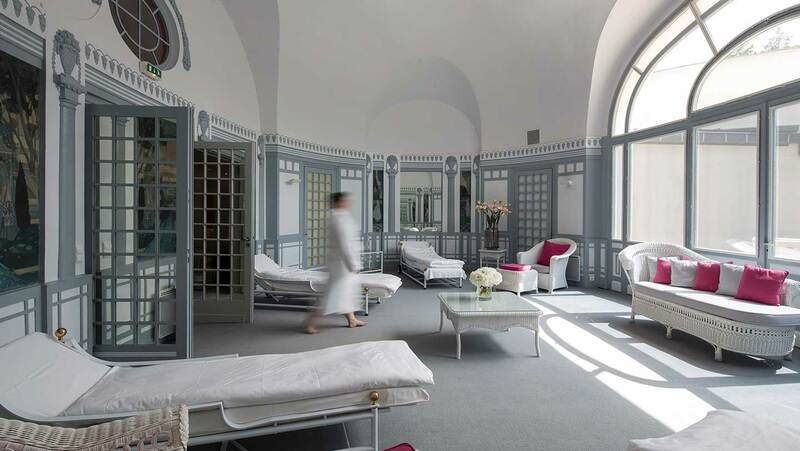 Spa Evian Source is bright and white with splashes of colour through soft pink cushions and textiles. The 30 treatment rooms are broken into sections; beauty treatments take place downstairs, and the rooms upstairs are set up for massage and relaxation. There’s a hair salon too, should you wish to preen pre-dinner. The Aga Khan relaxation room was the private apartment of Sir Sultan Muhammed Shah, and the décor has been maintained with beautifully intricate panelling, cornicing and frescos. Lay on a chaise longue and daydream of 1920s Chanel. Treatments are in four different streams: re-energise, relaxation, facial revelation and body revelation. The signature treatment is all about La Prairie with just over four hours of Caviar-range face, body and hair therapies. As well as La Prairie treatments you can try Comfort Zone treats, pregnancy and new mum treatments, and some unusual massages. The La Prairie facial was a mix of relaxation and some results-driven touches. Veronique, my therapist, cleansed, exfoliated, steamed and scrubbed my combination skin without over-drying or clogging up difficult patches. She cleansed again and massaged my face to stimulate my circulation. Veronique painted on a thick cool mask and massaged my hands, arms and feet. She removed the mask, cleansed and applied finishing moisturisers. The treatment ended with a blissful scalp massage. My skin was the perfect blend of clear and hydrated; idéal. There are three restaurants at The Hotel Royal: fine dining in Les Fresques, relaxed dining in La Veranda and, in the summer, outside dining at L’Oliveraie. La Veranda serves a good range of very French cuisine from croque-monsieur to caviar and fish fresh from the lake. Les Fresque is much grander with à la carte and gastronomic menus including a six-course set menu with wine pairing. Post-spa we weren’t quite up to the full six courses but our à la carte offering was creative, full of flavours and rather filling. 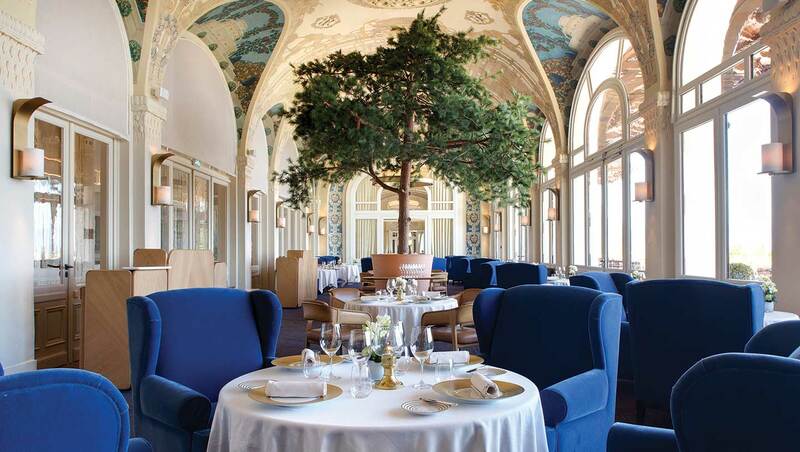 Both Les Fresque and La Veranda open onto the lake view which feels very special. 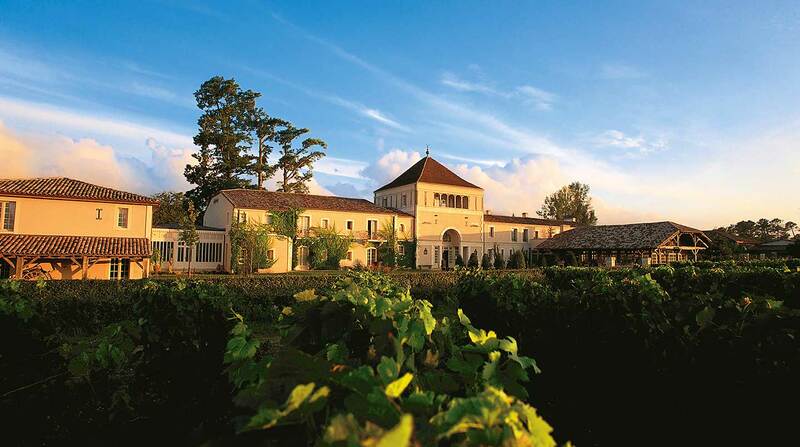 Romantics – the lake, the décor, the sense of history; this is one to enjoy with a beloved. Foodies – this is France, we expect the food to be good, but during our entire stay everything we tried was fresh, interesting and delicious. La Prairie fans – the iconic brand isn’t available in many UK spas, so it’s a treat to try it. Breakfast on your balcony – it fulfilled every archetype: beautiful croissant, rich coffee and a yacht sailing across Lake Geneva. The hydro-circuit on a sunny day – the pool is in a very sheltered spot, out of the wind but open to the sunshine.